The latest Jason Statham action movie, The Mechanic, is a solid action flick that suffers from one major Fridge Pipe moment. On my entirely personal measurement system, The Statham Scale (where Crank is 1 and The Bank Job is a 10) I’d say The Mechanic was a 7 (so just below The Transporter). Personally I prefered it to The Expendables. 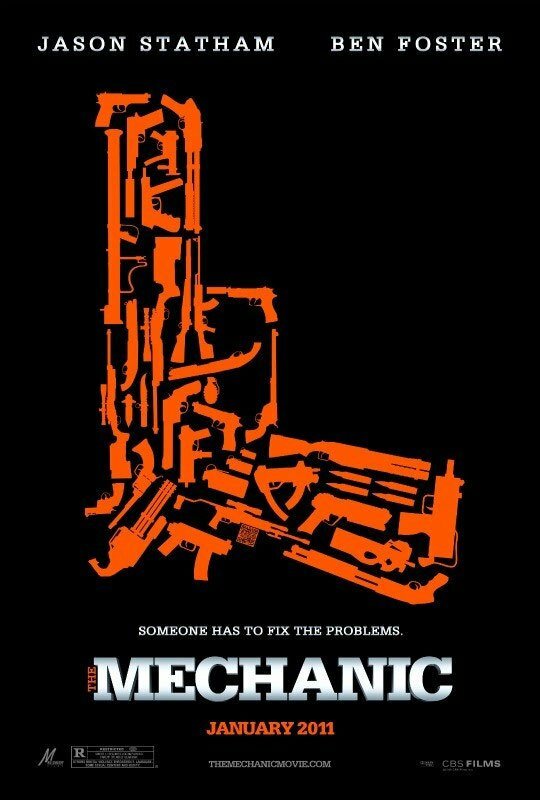 The Mechanic opens with a nice teaser that sets up Statham’s character, Arthur Bishop, as an efficient, cold killer who is a very cool customer. Where Luc Besson classic “cleaner” Léon delivers the phone in the opening sequence after bumping off all the body guards Wenk and Carlino’s “mechanic” makes it look like an accident under the body guards noses and doesn’t fire a shot. It then spends a bit of time setting up that Bishop is a loaner with few attachments to the world other than Harry McKenna (Donald Sutherland). Like The American last year he turns to a prostitute but unlike Clooney’s character he really doesn’t seem to be attached to her emotionally. We learn he lives alone in a designer house somewhere in the Mississippi Bayou that he travels to by boat. The house is immaculate with a top of the range record player and a secret room for keeping assassin stuff in. During this part of the film we get to see Sutherland and Statham together. These are some of the better parts of the film. Sutherland’s part could have been played by plenty of actors but he brings an extra something too it. He also raises Statham acting. So it’s a shame that he’s going to suffer an early demise here as he did in the 2003 movie The Italian Job (a film that would have probably done better here with a different name). After that we have a well executed slow sequence where Bishop takes Harry’s errant son Steve McKenna (Ben Foster) under his wing. Pretty soon he’s teaching him to be a hit man – much like Léon teaches Mathilda. This allows a few action sequences to be dropped in to build up the pace again. Then we get a full blown assassination that goes pear shaped allowing the guns to come out for a bigger set piece. Now we hit one of the moments in the plot I can’t make my mind up about – I’m not sure if Bishop is supposed to have stumbled on the guy who lets him know he’s been set up in the past or if he was waiting for him. I suspect the former but I wish that in some way it was the later. This in turn leads to the last big action set piece and then on after a few bits of tidying up to the end credits. I’ve mentioned Léon several times because although quite different movies there are similarities. The biggest difference has to be the character’s journeys. Léon stays in one place but goes on a journey that ultimately results in his self-sacrifice. Bishop remains throughout pretty much a cold fish who travels a lot but goes nowhere in the process – even when he appears to be becoming involved. Even going after the bad guys for revenge can be thought of as removing someone who is likely to come after him as a loose end. There is no way Bishop is going to end up flagged RED. This film has good points. The sound track is solid if nothing to write home about. The action is good if a little bit of a subpar Borne Supremacy in places. There is no dodgy CGI to add any silly comic book moments. The acting doesn’t suffer from any cringe worthy performances – it’s a shame that Donald Sutherland doesn’t get more time and that the main villain isn’t weightier to match. In the end The Mechanic is a pop corn action flick. Normally I slap the spoiler warning on once and leave it at that – however I really think I have to warn you about the following question – because it is a real spoiler. So here is the spoiler warning for a second and a third time. If you want my conclusions see back at the start before the first spoiler bar. The film that suffers from one major Fridge Pipe plot point – if Arthur Bishop is as smart as he appears to be through most of the film why doesn’t he figure out when he’s being set up to do the bad guys dirty work for them? When they tell him only two people can be responsible for some bad things we know what the first of the two twists will be. We know that when he kills Harry that only leaves Dean (is that his first name or surname). When he chance upon the revelation he only has one direction to go in. It also puts in motion what has to happen with Steve and then they go and telegraph both sides of that so we can see the second twist coming along just like the bin lorry that runs Dean’s car through a little bit earlier.